Generally, homeowners and business owners purchase insurance policies to protect their interests and property from the aftermath of hurricane destruction. Most of these policies provide recourse and reassurance that if the home or business is damaged, then the insurance company will pay out an amount of money specified under the policy language. Yet, when it comes to hurricane insurance, Florida home and business owners are frequently left going back and forth with their insurance company over a payout. The Law Offices of Michael B. Brehne, P.A. have a long and successful history of assisting home and business owners to make sure they receive the benefits outlined in their insurance policy. If you took the necessary hurricane preparedness steps and your insurance company denied the claim for Hurricane Michael damage, contact our law firm today. 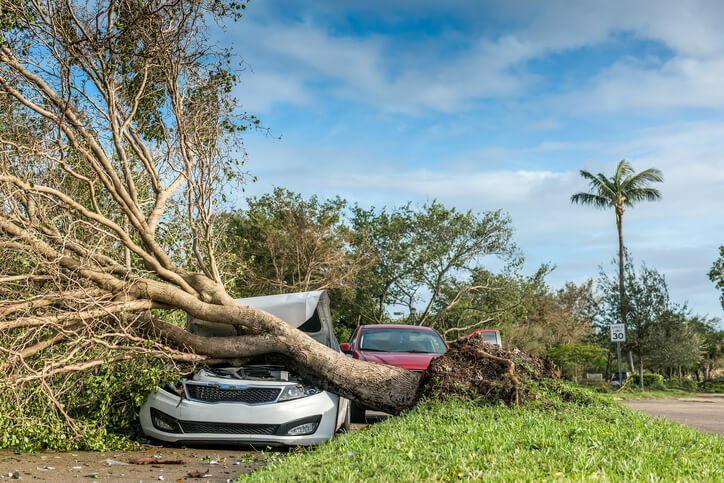 Perhaps the most common type of Hurricane Irma damage claim in 2017, wind damage is prevalent throughout the insurance industry. With sustained winds of 155 mph, Hurricane Michael destroyed thousands of residential and commercial properties throughout the Florida Panhandle, including Mexico Beach and Panama City Beach. High winds cause tree branches and limbs to break, shingles to blow off, and even boarded up windows can break from flying debris during the storm. Yet, many insurance policies require a higher deductible or additional policy coverages if the home or business is located in a high-risk area, such as a coastal zone. A roof can be damaged a number of ways during a hurricane, but most frequently it’s from blown off shingles or other roofing material and downed trees. Making landfall with category 4 winds — from which property damage could make homes unlivable for weeks or month — Hurricane Michael caused severe damage to property exteriors with fallen trees and power lines, including extensive roof damage and leaks. No matter how roof damage occurs during a hurricane, fast repairs are necessary to mitigate damage to the interior of the structure. For water damage to be covered, the damage has to come from a water source inside the home, such as a broken pipe, or wind-driven rain. This generally occurs because of a damaged roof and/or broken windows caused by the hurricane-force winds. Water damage caused by external sources, such as the extreme flooding and storm surge, may not be covered in its entirety or only provide partial coverage to certain properties. Hurricane Michael damage caused as much as $5 billion in insured property damage in Florida, including water damage. Some homeowners insurance policies include coverage for additional living expenses, but this coverage does have some stipulations. Generally, this covers the expenses you may face if you and your family have to stay in a hotel or elsewhere due to a hurricane evacuation. As Hurricane Michael strengthened and started its path to Florida, mandatory evacuation orders and advisories affected more than 500,000 Floridians. Food, housing, and transportation costs are also reimbursable with appropriate receipts for the expenses. Why Are Hurricane Insurance Claims Denied? Insurance companies use a long list of reasons to deny legitimate hurricane insurance claims, including these common reasons. Florida is one of 15 states that excludes windstorm damage from a standard property insurance policy. For wind damage from a hurricane or another type of severe storm to be covered, home and business owners need to purchase a separate windstorm policy. The way to remember this is that water damage caused by a source of water from inside the building is covered and an external source isn’t. Flood insurance must be purchased separately and may be required for a mortgaged property located in a high-risk area for floods, such as coastal properties with an increased liability for flood or surge-related damage. Permanently installed bookcases, cabinets, carpeting, paneling, and wallboard. A personal policy generally covers washers and dryers; clothing, electronics, and furniture; a freezer and frozen food; and up to $2,500 in valuables. Some home and business insurance companies include a clause in the policy language that removes coverage for the property if a covered loss occurs at the same time as an uncovered loss. This frequently occurs with wind damage and flooding caused by hurricanes. The policy wording along with the explanation provided by many insurance companies are often ambiguous and a hurricane insurance claim attorney can cut through the ambiguity and help you receive the insurance monies due to you for Hurricane Michael damage. After your home or business sustains hurricane damage, the last situation you want to find yourself in is going back and forth with the insurance company. All insurance companies have an express and/or implied duty to each policyholder, but sometimes the companies use tactics that are bad faith practices to minimize the impact to their bottom line. Not accurately investigating a claim in a reasonable timeframe. Yet, it’s up to the policyholder — usually a business or homeowner — to prove the company has acted in bad faith. To do so, you must prove these two elements. In the first part of a bad faith insurance claim, it’s up to you to establish the claim was valid under the insurance policy. Make sure there also is documentation the claim was denied. During this step, it’s determined whether the insurance company was reasonable in the reasoning to deny the claim. The situation is assessed objectively and based on the existing facts at the time the decision was made. What Is My Insurance Company Required To Do? Every hurricane insurance company is expected to wholly investigate every submitted claim. Failure to do so violates the duty to investigate as the insurance company is required to prove their findings and valuation of a claim. Any unreasonable delay of the investigation is also considered acting in bad faith. If a suit is filed against the policyholder, in this case, the homeowner, the insurance company must pay any judgment or settlement amount registered against the policyholder. Also known as the duty to indemnify, the settlement amount is usually up to the policy coverage limits. Insurance companies have the explicit duty to defend a policyholder against any suit, even if the suit doesn’t fall under the policy coverage. The only exception is when defense costs are included in the policy limits. The insurance company is generally required to provide defense for most situations no matter the limits of an individual policy. Depending on the jurisdiction, some insurance companies are required to submit a reasonable settlement rather than attempting to reduce their liability during a suit. These situations generally happen when a settlement is more advantageous to the policyholder. How Can A Florida Hurricane Attorney Help With My Insurance Claim? It doesn’t take category 5 hurricane damage to cause an unusually stressful situation after a storm. When you file an insurance claim and either have the claim denied or considerably underpaid, it only compounds the situation. But, a hurricane lawyer will act as your advocate and fight for your best interest and full compensation under the policy limits. If necessary, a lawyer will file litigation against the insurance company for an appropriate amount of reimbursement for the hurricane damage to your property. If your home or business has sustained Hurricane Michael damage, or you have questions about what your insurance policy covers, contact the Law Offices of Michael B. Brehne, P.A. today.